"Oh the things I was out of when I created this dish: no milk and no eggs, but we wanted pancakes, dangit! I used flax meal to make up for the protein in the egg (a vegan trick) and substituted orange juice for milk. 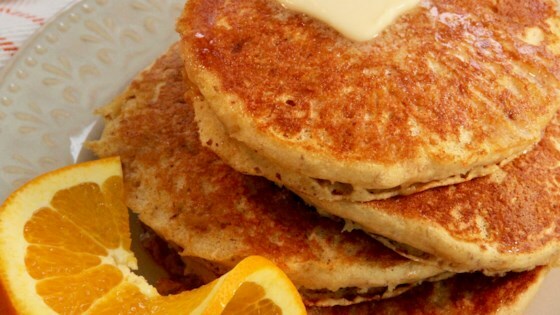 The result was pancakes bursting with citrus flavor. It's a new favorite in our house! Serve with butter and/or maple syrup." Whisk flour, baking powder, and flax meal together in a bowl; stir orange juice and orange extract into flour mixture until batter is well-combined. Heat a lightly oiled griddle over medium-high heat, or an electric griddle to 375 degrees F (190 degrees C). Drop batter by large spoonfuls onto the griddle and cook until bubbles form and the edges are dry, 3 to 4 minutes. Flip and cook until browned on the other side, 2 to 3 minutes. Repeat with remaining batter. I used a cup of white flour and a cup of whole wheat, but otherwise followed the recipe as written. Ate them with butter and syrup and they are quite good.